On The Cliff is situated on the beautiful Hermanus cliff paths, where you can experience the best land based whale watching in the world. The spacious and elegantly appointed en-suite bedrooms all have stunning sea views over Walker Bay, and we are within walking distance to both the new harbour and the old harbour in the village centre. Facilities include a sauna, heated pool, putting green, cosy pub with fireplace, and two guest lounges with fireplace. We also arrange in-house massage and reflexology treatments. Beach: We are very close to the beach, and each room has guaranteed full sea views. Spa: We offer massages, reflexology, aroma therapy, facials and manicures and pedicures. Well positioned and very close to all amenities in Hermanus.Room was comfortable ,good breakfast and a friendly hostess.Maintenance done quickly and efficiently. We stayed at On the Cliff for 3 days. 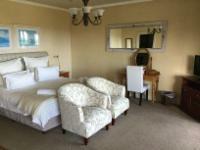 This is an up market B&amp;B situated 5 minutes drive from Hermanus town centre. It has a fantastic view of the Ocean. It is clean and well kept. The breakfast is substantial with a choice of cooked or health. The rooms are large and there are plenty of areas where you can sit and read if the weather is poor. Charmaine and Hylton are perfect hosts always willing to engage in conversation. Charmaine was willing to assist with all our needs. We have stayed there before and will go back anytime. We had to leave a day early because of bad health. The temporary managers (the Owners were away) were really excellent and most attentive. On The Cliff is 1.2km from the centre of Hermanus , the nearest airport 86.7km (Cape Town International Airport).